Ready to upgrade your window treatments? 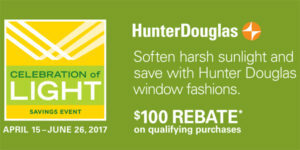 Now’s a great time to buy—Hunter Douglas is offering rebates on select energy-efficient window fashions. Speak with a trained specialist here at Treasure Coast Window Fashions. We’ve been serving West Palm Beach for years, and we’ll be happy to help you as well. Now through June 26, you can get rebates on Hunter Douglas Silhouette window shadings, Pirouette window shadings, or Luminette privacy sheers. Simply meet the minimum unit requirements as outlined below; after your products are installed, mail the rebate form and a copy of your receipt to the address provided. Then Hunter Douglas will send the appropriate rebate to you in the form of prepaid rewards cards. It’s as simple as that! All three of these premium window treatment options are energy-efficient and designed for homeowners who like the very best. Silhouette window shades, with their soft functional fabric vanes, will make your home feel warm, soft, and inviting. The vanes in the Pirouette shades help you control light and harmful UV rays; extremely versatile, this product can be fun, flirty, and the perfect fit for any room in your home. Luminette is great for large openings like sliding glass doors or walls of windows—beautiful and functional, the product will make your room a talking point in your house.